Thomas Farish Williamson (10 February 1836 - 23 March 1911), early tobacco manufacturer, planter, and church leader, was born at the family plantation, Poplar Grove, in the Stoney Creek Township of Caswell County, the second son of Thomas and Frances Pannill Banks Farish Williamson. His father, a wealthy planter and merchant, died in 1848, leaving the care of their seven young children and of his lands and business interests to his capable wife, Frances. In his will he stated his full confidence in her fidelity, prudence, and sound judgment. Except for designated plantations left to each son, he gave her complete freedom in the management of his estate, and he authorized and directed her to provide for the education of their children "whether at school or at college or for a profession." Frances Farish Williamson was a descendant of prominent Virginia families. Her maternal uncle, Linn Banks, was a member of the Virginia legislature for twenty-four years and speaker of the house for eighteen of them; he was serving his third term in Congress at the time of his death. This interest in politics did not descend to Banks's great nephews Thomas Farish and his younger brother, textile manufacturer James Nathaniel Williamson; they never sought state or national offices but served from time to time in county or town political positions. Thomas Farish Williamson's main interest was in agriculture, especially in growing and improving tobacco. Although he lived in town the latter half of his life, he always owned a farm close by. As soon as he was of age, he received the plantation willed him by his father and he called the place Sunnyside. It was here in the Locust Hill section of Caswell County in the early 1870s that he began the manufacture of plug and smoking tobacco. Two early chewing tobacco brands marketed by T. F. Williamson and Company were Red Juice and Red Crow. The firm's Golden Grain granulated smoking tobacco, for its first sixty years a straight bright leaf blend, continued to be made by Brown and Williamson Tobacco Corporation for many years afterward. 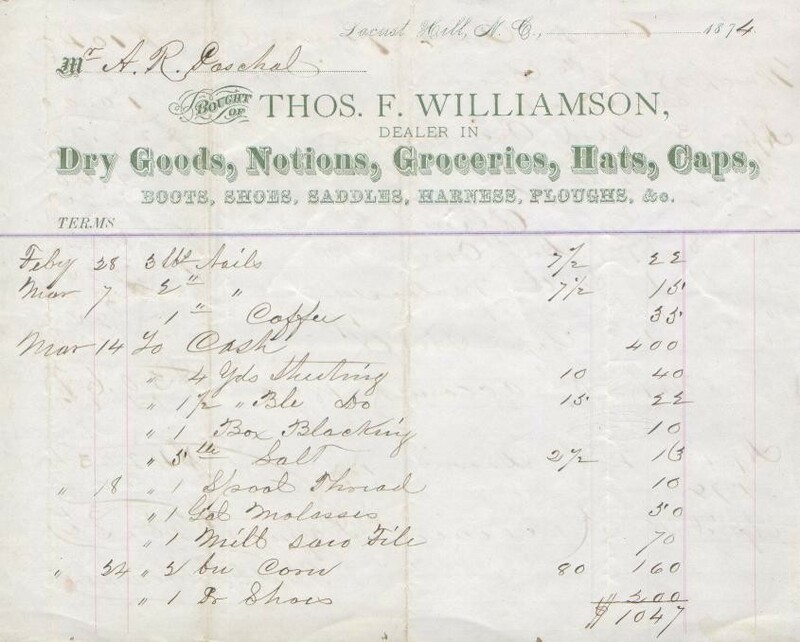 It also appears that Thomas Farish Williamson was involved in the dry goods retail trade in Locust Hill, North Carolina. See the 1874 Thos. F. Williamson customer statement showing the account of A. R. Paschal. By 1878 T. F. Williamson and Company had a factory in Reidsville. Before 1880 Captain Tom, as he was called, moved the plant and his family to Winston, where his business prospered and expanded. In 1894 T. F. Williamson and Company was purchased by his oldest son, Robert Lynn Williamson, and George T. Brown as the foundation of their new firm, Brown and Williamson Tobacco Company. By 1900 Captain Tom had moved to Leaksville (now Eden), where he owned and operated a general merchandise store. Maintaining his interest in agriculture, he bought a farm within sight of his home in town. Always concerned for the welfare of his community, her served on the town council where he was known for this sage advice and ability to conciliate opposing factions. An active and devoted member of the Presbyterian church, Williamson served on its boards wherever he resided: first in his home church, Bethesda Presbyterian Church in Caswell County, then the First Presbyterian Church in Winston, and finally the Leaksville Presbyterian Church. In 1858 he married Lydia Minerva Harris of Pittsboro; they celebrated their fifty-first wedding anniversary before she died in 1909. They had eight children: Mary Alice (m. first Alexander T. Benton and second Judge Martin Byrd Wood), Robert Lynn (m. Minnie Thompson), Lulu Lee, who died in her teens, Charles Harris (m. Bettie Shepherd), Anna Banks (m. Walter R. Leak), Frances Cornelia (m. John C. Anderson), Thomas Farish, who died in childhood, and Carlton Adolphus, who died in his twenties, unmarried. Thomas Farish Williamson died at the home of his daughter in Bristol, Tennessee. He was buried beside his wife in the Leaksville (Eden) Cemetery.
. . . John Lea Williamson who held the same two degrees [bachelor's and master's degrees from the University of North Carolina] moved to Graham where he practiced medicine and became a cotton manufacturer. Thomas [Farish] Williamson and his son, Robert, established the Williamson Tobacco Company in Stoney Creek Township but later moved to Winston-Salem where they were partners in the Brown and Williamson Tobacco Company. Although the town of Winston had only a few hundred residents and no paved roads, Mr. Reynolds saw two potential keys to business success: Winston was a production center for flue-cured tobacco leaf, and the town sat on a newly built railroad line. Someone once said about Mr. Reynolds, "He can see further ahead than most people can see behind them." Having started a chewing-tobacco business, he correctly anticipated the growth in popularity of smoking tobaccos and introduced pipe tobaccos supported by memorable advertising campaigns. He then went on to revolutionize U.S. cigarette blends, marketing and packaging. Around the same time as R.J. Reynolds was founded, Brown Brothers Tobacco Manufacturing Co. was operating as the largest tobacco company in nearby Mocksville, N.C. It was managed by George Brown and his brother, Rufus, both sons of a tobacco merchant. In 1893, George Brown formed a new partnership with his brother-in-law, Robert Williamson, whose father owned two tobacco factories. One of these factories was located in the same town as Mr. Reynolds' factory, Winston, N.C., and the other one was in Caswell County, N.C. Initially, the partnership took over the elder Williamson's business. Later, the new company, Brown & Williamson, leased a small facility, hired 30 employees, and began manufacturing in February 1894. 1925 Brown & Williamson purchased J.G. Flynt Tobacco Co. and its trademarks, including the popular Sir Walter Raleigh smoking tobacco. The following year, the company bought R.P. Richardson Company, which had just started to market manufactured cigarettes. 1927 Brown & Williamson was acquired by London-based British American Tobacco p.l.c. (BAT) and reorganized as Brown & Williamson Tobacco Corporation (B&W). This enabled the company to increase its production capacity and expand its distribution beyond the Southeast. Construction began on a new B&W factory in Louisville, Ky.
1928 B&W's first national brand, Raleigh, was launched as a premium cigarette. 1933 B&W launched Kool, the first U.S. menthol brand to gain nationwide distribution. 1960 Belair, a menthol brand, was launched nationally by B&W. 1980 B&W introduced Barclay as an ultra-low tar product featuring an "Actron" filter. 1984 B&W acquired the marketing rights for GPC (bargain-priced cigarette). 1987 B&W introduced Capri, a stylish cigarette with a circumference of only 17 millimeters. The introduction of Capri established the "superslim" cigarette category. 2003 R.J. Reynolds Tobacco Holdings, Inc., and British American Tobacco p.l.c. announced that they had signed an agreement to combine the U.S. assets and operations of R.J. Reynolds and Brown & Williamson Tobacco Corporation, the second- and third-largest tobacco companies in the United States. 2004 On July 30, 2004, following approval by RJR shareholders and U.S. and European regulatory authorities, Reynolds American Inc. (RAI) was established as the parent company of R.J. Reynolds Tobacco Company, Santa Fe Natural Tobacco Company, Lane Limited and R.J. Reynolds Global Products. This followed a transaction that combined the nation's second- and third-largest tobacco companies, R.J. Reynolds and the U.S. operations of Brown & Williamson Tobacco Corp., under the R.J. Reynolds Tobacco Company name. Copyright © Caswell County Historical Association, Inc.